Posted on January 17, 2019 by gayle. 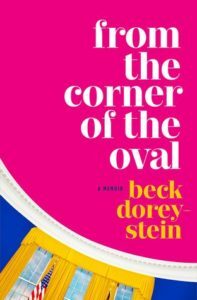 This entry was posted in 2019 EDIWTB Reading Challenge, Audiobooks, Memoir, Non-Fiction and tagged beck dorey-stein, from the corner of the oval, memoir, obama, white house. Bookmark the permalink. I loved this on audio! She was a great narrator and she sounded like someone I could be friends with. I don’t think it was supposed to be the kind of memoir that delved into the political ins and outs of policy….and I’m glad it wasn’t. I also loved this book! Was recommended to me by a woman in my knitting class . Yes , loved the kind of haphazard way she got job , but was really struck by how good a writer she is. Loved how famous editor of New Yorker, David Remnick urged her to take note of what was going on and she assured him she was already writing about it ! Also miss President Obama heaps , every day.